Best bang for the buck! 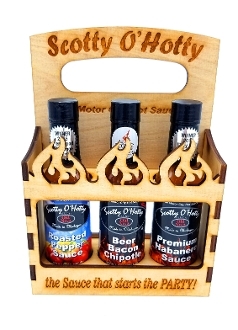 These 3 delicious sauces are family friendly & ready to enhance all your food. The "mild" 3 pack features our award winning Roasted Pepper Sauce, Beer Bacon Chipotle "original" & our most awarded sauce that started it all; Premium Habanero. Includes a hand crafted carrying case that is perfect for cookouts.